Fellow adventurers, how may I be of assistance? Every party needs a lore master, and I’m chuck full of "it", and not afraid to use it! In addition to my many musical and storytelling talents, my magics could help the group when it matters most for persuasion, languages, disguise, illusions, and healing. At 6’7” (200cm) I just happen to be a little taller than average. My parents fed me very well… And my aunt would explain “it’s just a glandular thing”! Though never one to shirk hard work, once a day’s heavy tasks were complete, while others would rough house and work in the smithies, lumber mills, stonemason halls, or other physical crafts, I was studying histories, cultures, and especially music and stories. As I began to pass 5’ in height at an early age (especially for a dwarf), some began to claim, and taunt, that I wasn’t really a dwarf, but actually a Humie (human). Some had the temerity to claim I was actually adopted! An accusation my parents strongly refuted. These barbs lead to many a brawl in my youth. Okay, even to this day, anyone besmirching my Dwarfhood should be ready for fisticuffs! I just turned 30. My Dwarven sister is now in her teens. My parents are on the run. I hope some day to rejoin my family. I also continue to hope for the day I can make amends to my clan, my slain aunt, uncle, best friend, and the others killed by the Drow due to my errors. I dream of one day being able to return of my own volition, with my head held high, to the great halls of The Ironwood Clan, as a hero, rather than hauled back as a criminal. 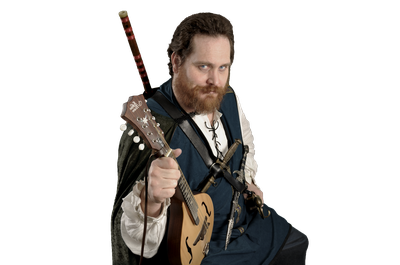 Hawke Robinson is playing the eccentric 6'7" Dwarven Bard of the Ironwood Clan, wielding instruments, songs, stories, and magic. Role-playing gaming since 1979, a published retired computer scientist & IT executive, father of 3, recreation & music therapist, researcher, founder of the RPG Research Project, and many other endeavors. Enjoys cross-country motorcycle adventures, outdoors recreation, ASL, target practice with firearms & bow, martial arts since 1974, and playing 20+ instruments.